TPC Overall Rank: #396 out of 2933 rides. In User Top 10: 13 times. User Tracker Count: 312 times. Yes this thing so freaking awesomeeeeeeee. It is a steel indoor coaster built by Intamin in 1996. It is 41 feet tall and has a 37 foot drop. It is 1,377 feet long. This indoor coaster has a very nicely themed station before taking riders into a darkened building on a twisting journey. The building looks like a skull with waterfalls coming from its eyes. It is fun, rerideable, has a large capacity, and a good ride duration. It is a must see for enthusiasts or anyone. It made Great Adventure different from other parks. This was really an enjoyable coaster, and should not be skipped by any enthusiast, family, teenager, or anyone else. I just loved the quirky theme to this ride. Various little parts of the ride reminded me of Volcano the Blast Coaster, and I wasn’t expecting that at all! The mountain, the shields and skulls as themeing, the indoor/outdoor aspect, and even some of the “Intamin sounds” the rides make are just eerily similar! The ride itself was pretty good, about a 5 depending on your seat, but the build-up and themeing was enough to make it an above-average 6. There’s nothing all that scary about the ride itself, but the park did everything they could to put in cheap, wacky spoofs! The weird music, the long dark tunneled queue line, the waterfalls, the announcement of “Six Flags most terrifying coaster;” It may not sound like much, but it worked for me! The building wasn’t too dark, but still ALMOST pitch black. The ride itself begins with a small drop that provides airtime in the back and none at all in the front. The middle was alright with some twists and such, but basically was a lowlight of the ride. Some of the turns caught me off guard because of the darkness, so they did their job well. There is another hop at the end of the ride which may or may not produce airtime in the back. It should, but I didn’t really notice any. Over all, the ride is a little short, but it is smooth and has one or two good moments of airtime. Nothing really major, but it serves its purpose well and is good fun. I liked a lot of its aspects better than the parks “number two” Intamin, Kingda Ka. Skull Mountain actually has a decent capacity, smooth ride, AIRTIME, and…….oh yea…….a layout! It’s a wonder that I actually liked Ka better. The theming is somewhat good, in the station. The strobe lights were off and you could see some of the track. The first drop is very surprising. 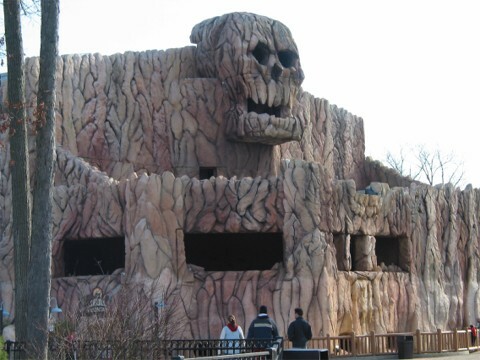 Mixed in with all of Great Adventures massive rides, Skull Mountain may seem like a somewhat trivial coaster. But it is actually quite good. The external building is very well done, with some nice detail and theming. The ride itself is reasonably thrilling also. I like how it starts out slowly passing along the walls with openings to the park, as if to imply "say goodbye to the outside world before being drawn into Skull Mountain." The coaster is quite appropriate for this type of enclosed, in-the-dark attraction. It isnt incredibly fast or long, but it does have some good curves and dips and even curving dips. The darkness is maintained well throughout, which can always turn even a mediocre coaster into a much more exciting ride. Eh, I should say this ride was okay, nothing too good or special about this ride. I should say this ride was too short, and it would be much better if it was longer and darker as well. The theming of the ride was great, but why didnt they complete the back of the building, its just blue walls at the back. Eh, its average. I dig the theme, but the elements are very limited. The strobe lights werent on today, too bad. I guess the drops are kinda unexpected, but not very big, not to be too spoiled. One of the only good things was--there were some guys who let me cut them in line. Thank you, people. If youve never tried a dark coaster, go ahead, no ones stopping you. Just check it out, and move on.